An American ramen master sets up shop on the Lower East Side. : Ivan Orkin, an American who moved to Tokyo and mastered the art of ramen making (and even became something of a celebrity chef there in the process), opened his first non-Japan-based ramen eatery in late 2013 in the Gotham West Market. 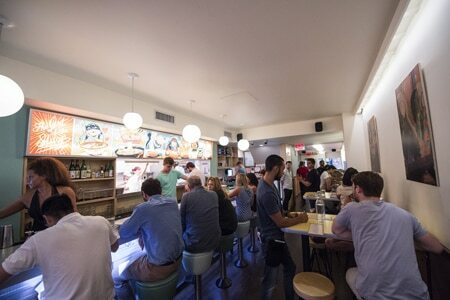 In mid-2014, he debuted Ivan Ramen, a Lower East Side restaurant dedicated to what Orkin does best. There are several intriguing variations of ramen on the menu: the triple pork triple garlic mazemen is, as the name suggests, a porcine explosion. Mazemen ramens lack broth, save for a puddle at the bottom. For something more soupy, try the shoyu ramen, a simple creation boasting a deep, long-lasting broth. If you want to supplement your ramen with other savories, try bonito-spiked pork meatballs or the braised beef tongue. Drinks consist of beer, saké and a couple wines on tap.